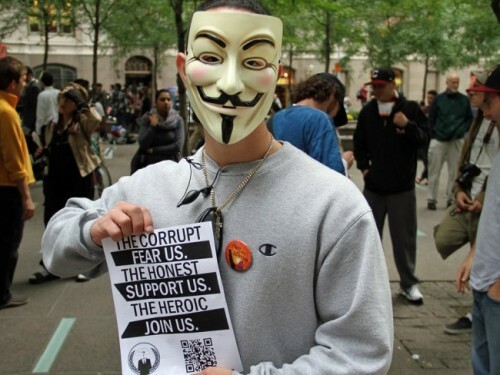 The mobile phone number and home address of Vikram Pandit, the chief executive of Citigroup, have been placed on the web by hacking group CabinCr3w in retaliation for the cuffing of protesters at an Occupy Wall Street demo. The hackers said in a statement online that they had accessed the data - which also included family information and some financial figures - and uploaded it online in response to events during the recent anti-bank protests on Wall Street. "During Occupy Wall Street [protests], protesters had made way to CitiBank to withdraw their funds and close their accounts. They were met with strong police prescence [sic] and arrested," CabinCr3w wrote. "We as american citizens MUST have full control over our money and lively hood[sic].When this is taken away from us, what else do we have? So the CEO of CitiBank has blindly jumped into the sights of the CabinCr3w". PLast week, Pandit said he would be happy to meet with Occupy Wall Street protesters, who blame the financial sector for the bad economy, and oppose its influence on US politics and said he understood their concerns. CabinCr3w is responsible for data dumps on other bankers as part of the protest movement, including the CEOs of JP Morgan Chase and Goldman Sachs, as well as a New York police officer who sprayed pepper spray into protesters faces.